Last night we watched the mini-series ‘Rebellion’. It’s the story of the Irish 1916 Easter Rising. Back in 2016 my partner and I went to Dublin to participate in the celebrations of the Centenary of the Rising. It was incredibly moving to be a part of it and I learned so much not just from museums and ceremonies but from interacting with people and seeing the places where events took place. It was a bit of a messy uprising, not terribly well organised, with too few and largely untrained and poorly armed ordinary people – turned soldiers by necessity. The uprising was cruelly and relatively easily crushed by the military might and organisation of British colonial forces, fuelled by a typical and pathological sense of entitlement and drunk on power. Large parts of Dublin were left in ruins after the centre of the city with all its landmark buildings was bombed heavily from the River Liffey. Who knows how many people really died and how many were scarred for life because of what they experienced. I have only become properly acquainted with the story of Ireland in the past four years since I met my Irish partner. When I asked myself why I knew nothing about Ireland, I realised that we never learned anything about Ireland or about colonialism back when I was growing up in Israel. I did listen and pay attention at school. I was a curious and motivated straight ‘A’ student throughout my primary and secondary education. If they taught us anything, I would have remembered. In ‘general history’ we learned nothing about colonialism, about the Americas, about India, Australia, the Vietnam war. We learned about Britain only in Zionist history as the ‘empire’ that oppressed us the Jews in Palestine. We learn about how our ‘brave’ underground movements successfully fought against the British and ‘drove them’ out of Palestine. We learned nothing about British colonialism and settler-colonialism. We learned nothing about what colonialism in general does to people, the injustices that Britain and other colonial states have inflicted on their colonies all over the world. We learned nothing about the colonial slave trade, the suffering of indigenous people or the fight for independence in so many colonised parts of the world. We learned nothing about Africa or Apartheid in South Africa which was still very much on when I was at school. We learned nothing about women’s rights and women’s fight for suffrage and for equality. I have always believed that the quality of our education (which was very centralised) was good. But was it really that good if it was filled with so many holes, and such big holes at that…? I could not have known that we were educated to know what the powers that ruled us wanted us to know. No more, no less. The job of education was to prepare us to become good little drones who would not question or disobey, and who would be shaped into another generation dedicated to maintaining and continuing the Zionist settler-colonial project in Palestine. For the most part it was a success. My generation does in Israel or even outside of Israel exactly what it was expected to do. I am one of the failures of that education system and it doesn’t have that many. Why did we learn nothing about colonialism? Why did we learn nothing about what colonialism does to indigenous people, why did we learn nothing about so many oppressed indigenous people’s fight for liberation? We learned about the Jewish colonists in Palestine’s fight against the British mandate as if it was a just and righteous fight of oppressed against oppressors. It was so twisted. When we learned about our own fight against the British mandate we learned it from a uniquely narrow Jewish Israeli perspective. Why did we not learn anything about the fight against slavery, or the long fight of women for our right to be considered equal human beings? I suspect this was deliberate. If we learned about what colonialism does to people it would have been only a matter of time before some of us at least might have started to join the dots. If we understood colonialism and what it does to the colonised, there was a risk we might place what was happening to the Palestinians in this context. And it would have been the correct context, except Israel never wanted us to see that Zionism is a settler-colonial movement like any other before it, and that it has been devastating the indigenous people for our ends and purposes just like any other settler-colonial movement before it. Israel never wanted us to see that what the Palestinians were trying to do was what all colonised people have always tried to do: resist. They couldn’t afford for generations of Jewish Israeli children to grow up seeing the truth. I would not have gone so willingly to serve my two years in the military if I had known the truth. 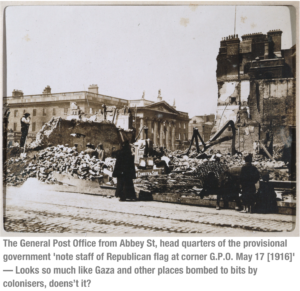 When you read about Britain’s colonial rule in Ireland, when you see the images from hundreds of years of colonialism and settler-colonialism, when you read the stories and understand the legacy, it’s easy to see the similarities between what the British were doing in Ireland and what the Zionist movement/Jewish Israelis are doing in Palestine. The same tactics, the same control, the same policy of dehumanisation and elimination, which includes attempting to erase a culture, its stories, language, everything that makes it unique. Without dehumanisation it’s hard to hurt people. If you can see that the other is the same as you, it’s not so easy any more to hurt and do harm. If you can dehumanise the oppressed in the eyes of others, you can also ensure they will not have much support. I was an abused child who grew up in a highly controlled environment where I lived under my oppressor’s magnifying glass. From when I was a baby I was on the receiving end of violence in all its forms. When I began occasionally to fight back, my oppressor crushed me. It is not hard for an adult to crush a child. I had no rights and no power. She had everything. I couldn’t get away because I was dependent. Even when I was old enough it took a considerable psychological journey to finally break away from the hold and codependency that my oppressor groomed me into. When you are oppressed you are not allowed to be yourself. Oppression is about power and control. It has no other reason except the desire of one to use another for their own ends. When you are oppressed you are not a person. You are a resource. As a resource you have two choices: Surrender and be whatever your oppressor wants you to be, lose yourself and be destroyed slowly, or rebel and pay the heavy price of using up all your resources just to resist and deal with the backlash, which always comes. Instead of growing, developing and dedicating your resources to living a full life, you become a soldier, a fighter by necessity. The essence of oppression is having no good choices. Psychopaths make sure of it. You either sacrifice everything you are or you are forced into a life of fighting. Either way you can be destroyed. As a fighter, you also have to live with labelling from others, you are a ’terrorist’ or an ‘ungrateful’ and ‘bad’ child… People who are oppressed get little sympathy. I got none. If I was a child now, there is a chance I would be removed from my family. Back then there was no protection for children. Parents were gods and society didn’t intervene in ‘domestics’. Beating up children (and women) was the norm, and sexual abuse of girls in the family, especially by the father, was seen by the psychiatric profession as not only not harmful, but in fact helpful to girls’ development…! (This changed only in the 1980s thanks to one wonderful woman, the psychiatrist Judith L. Herman). I had nowhere to turn to even if I dared to speak up. No one would have believed me. Everyone would have sided with my parents. But I couldn’t say anything anyway, because part of the system of control around me was that I wasn’t allowed to talk to anyone about what was going on in the family and the kind of life I had. I had to always present a happy façade and look happy so that my family looked good to others. I think that even if people knew the terror I suffered every single day of my childhood and adolescence no one would have helped. Being the poorly developed mammals that we are, people gang up against victims rather than help them. We still sacrifice individuals for the pack. We instinctively protect the pack, which we believe we need for our survival. If an individual or a few individuals have to be sacrificed, so be it. Even now, in late 2018, we’re still struggling to protect children and other oppressed people in our society, and there are plenty whose lives are terrible here and elsewhere in the world. There are children, at least a quarter of girls and we don’t know how many boys, whose daily lives are nothing short of hell of sexual abuse and violence. We are still far away from seeing when a child is suffering, and when we do notice, what is done about it if anything is still woefully inadequate. Despite lip service to the contrary, society still protects the family. In the world in general we still protect oppressors at the expense of their victims. The family is a microcosm of society and society is a microcosm of the world. I have always wondered why the story of Ireland has touched me so deeply. I think I understand it now. It’s because I recognise it from my personal experience. I know what it’s like to be powerless, caught in the grip of psychopathic control. I know what it’s like to try everything to be ‘good’, to please the oppressor, to try to follow the rules they give you because they promise that if you do, all will be well. But soon enough you realise that actually there is nothing you can ever do to make your life better. As the trap slowly closes around you, you realise that there is nothing you can do to control anything because all power and all control are in the hands of your oppressor. You have none. In a psychopathic system the biggest thing you are robbed off is the right to your personal power. Only oppressors are allowed to have power. This is why the Irish rebellion was crushed so horrifically. This is why Israel responds so disproportionately to any sign, including peaceful, harmless signs, of Palestinian resistance. Israel wants to let the Palestinians know that they have no power at all and rob them of any hope that they will ever have any. When you fight against oppressors, you are labeled as bad and are punished even more. If you try to seek help elsewhere you are called names, are dehumanised and isolated. This is what happened to Irish people and anyone who ever fought a psychopathic system. This is what the Palestinians are experiencing right now. Yes, I am saying that colonialism and settler-colonialism are essentially psychopathic systems. It is the right of oppressed people to fight back to try to free themselves. It is our duty to help them. Whether they are individuals or groups who are caught in an oppressive psychopathic system, we have a duty to help destroy the power structure that holds them captive, that uses them as a resource and that prevents them from living a full life and developing their unique potential. 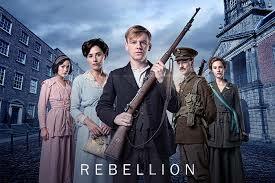 I watched ‘Rebellion’ last night wondering where I would be and what I would do if I lived in Ireland then. I know that it depends on who I was and what kind of family and social class I came from. I am a female, so that would mean that I would still be at the bottom of the social pecking order. I would like to think that I would have joined the fight to free not just Ireland but also women and poor people from the tyranny of oppression. I would like to think that I would have been prepared to die for this cause. I am alive and I have a voice now. I would like to contribute to a world that does not allow anyone to waste their life being crushed or by being forced to becoming a fighter. booкmark your blog and will often come back at some point. great wгiting, have a nice morning! Thank you for translating and publishing Jürgen! What is the site you placed it on? I am unable to read German. 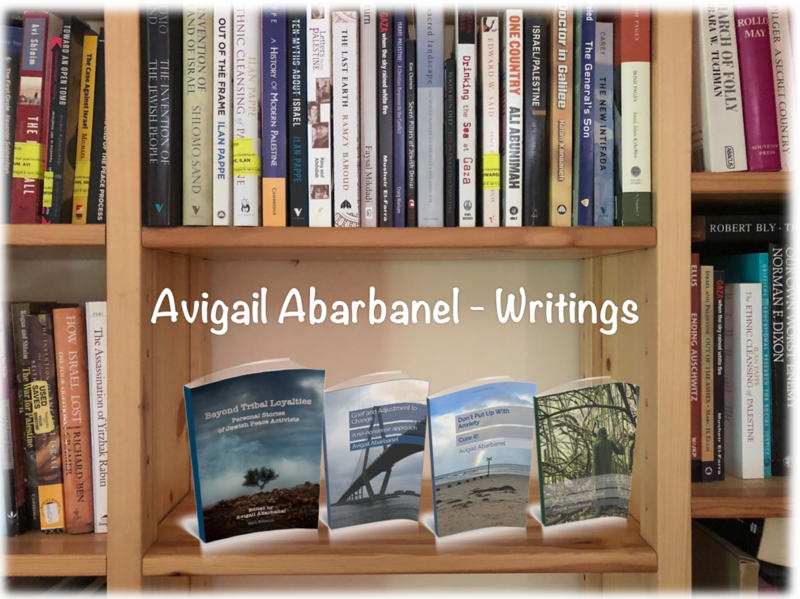 I consider it an honour to translate your moving thoughts, dear Avigail! The piece was published here in Germany in ‘Palästina Portal’ (http://www.palaestina-portal.eu/) and in ‘Der Semit’ (http://der-semit.de/). A decade ago I already translated your excellent ‘Survival Instinct or Jewish Paranoia’. We had a short contact in those days, remember? Dear Jürgen, Thank you so much and forgive me but I didn’t remember you. I do remember the article being translated at the time but didn’t remember who did this, or that we had an email exchange. I apologise for this! I am grateful that you haven’t forgotten me though, and thank you so much for publishing my work to German-speaking audiences. Best wishes from the north of Scotland. Thank you for translating my article into French. I deeply appreciate it! !